How do the solstices reflect changes in sunlight? These images show the amount of sunlight reflected from the Earth on the 2004 December solstice and the 2005 June solstice. In the December solstice, the far north is dark blue, indicating that no sunlight is being reflected back into space. The most sunlight is being reflected out of the Southern Hemisphere, which is experiencing the summer solstice, the longest day of the year. In the June solstice, darkness dominates the south, while the north is now the location receiving and reflecting the most sunlight. A NASA satellite instrument, CERES, took these images in 2004 and 2005. The images are measurements of the Earth’s albedo—the amount of solar radiation reflected from Earth back into space. The CERES images show a radical difference in albedo between the Northern and Southern Hemispheres, as well as between the December and June solstices. 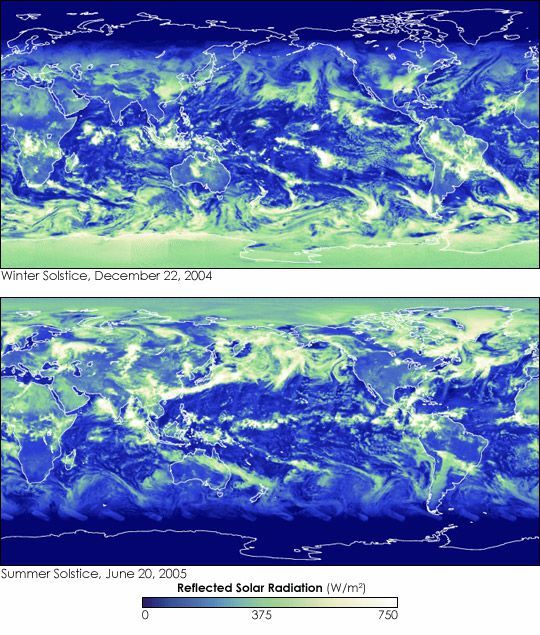 The Southern Hemisphere reflects a tremendous amount of radiation during the December solstice (top image), while the Northern Hemisphere reflects more radiation in June. Consult National Geography Standard 7.2 (4th grade): The physical processes that shape the patterns of Earth's surface. Earth-Sun relationships affect conditions on Earth. Questions in the "Questions" tab explore some ways solar radiation differs in the Northern and Southern Hemispheres on the solstices. Why do you think the Southern Hemisphere reflects so much more solar radiation than the Northern Hemisphere during the December solstice? This illustration might help you. The Southern Hemisphere simply has more sunlight to reflect! The winter solstice is the longest day of the year in the Southern Hemisphere. This means it experiences more sunlight on this day than any other. In fact, in parts of Antarctica, there is no nighttime at all during this part of the season! The December solstice is when the Southern Hemisphere receives the maximum intensity of the sun’s rays. The angle of sunlight is greater in the Southern Hemisphere during the winter. During the June solstice, the opposite is true. The Northern Hemisphere receives the maximum intensity of the sun’s rays, while the angle of sunlight decreases in the Southern Hemisphere. When the polar region of the Northern Hemisphere is reflecting the maximum amount of sunlight (the June solstice), it doesn’t reflect nearly as much light as the polar region of the Southern Hemisphere when it reflects its maximum amount of sunlight (December solstice). Why do you think the Southern Hemisphere reflects more solar radiation? The polar region of the Southern Hemisphere is dominated by land—the continent of Antarctica. Even during the “warm” season (the December solstice), Antarctica is covered by a thick ice sheet. Ice reflects light beautifully. The polar region of the Northern Hemisphere is dominated by the ocean. During the June solstice, sea ice on the Arctic Ocean is at its minimum. Liquid water is better at absorbing, not reflecting, solar radiation. The 2013 December solstice will occur on Saturday, December 21. Will it be the shortest or longest day of the year? That depends on whether you’re in the Southern or Northern Hemisphere! It will be the shortest day of the year north of the Equator—very little sunlight will be reflected back into space. It will be the longest day of the year south of the Equator—summertime. According to CERES, the amount of solar energy received at the North Pole is 30% higher during the summer solstice than the amount of solar energy received at the Equator. Solar radiation measured by CERES includes not just the visible spectrum of light, but ultraviolet and infrared—wavelengths too short (ultraviolet) or too long (infrared) for the human eye to see. to rebound or return light from a surface. visible radiation from the sun.